Posted July 4, 2006 in 2006/07, 4 DC (early), Harvey Covers, Periods, Serial Posts, Topic, z Archive. Starting with a cover date of April 1942 and ending in October are a series of 13 Harvey covers that were obviously done by Simon and Kirby (Speed #17 to #21 and #23; Champ #18 to #21 and #23; and Green Hornet #7 and #9). I say obvious, because they were done at the same time as S&K were producing work for DC and all this work show Simon and Kirby forging their own unique style. But none of the Harvey covers are signed by Joe or Jack. Instead some bear the signature of Jon Henri. Joe has said that he came up with this name. Henry is Joe’s middle name and he liked Jon so much that one of his son’s has it as a middle name. But the presence of the Jon Henri’s signature on some Harvey covers that clearly were penciled by Jack Kirby indicates that this name could not be a pseudonym for Joe Simon alone. In fact the Jack Kirby Checklist and most experts and scholars credit all of these covers to Jack Kirby. I will be presenting my case for attributing some of the covers to Simon below. Previously we have seen Joe and Jack work on different pages for the same story. In doing so Joe adjusted his style to try to mimic Jack’s. But that work is of limited use to us since in the work for Harvey and DC, Simon and Kirby has already progressed well beyond what they did for Timely. Unfortunately the best comparisons to be made with work by Joe Simon is for material we have not discussed yet. So I will ask you dear reader to try to keep an open mind until I presented some of that evidence in future chapters. I believe I can see two different artists at work among these Harvey covers. But care must be taken that we do not fall into the trap of crediting the best covers to Jack and the poorer ones to Joe. What we want to look for is differences in style and leave aside for now any value judgments. All the Champ covers in question illustrate the Liberty Lads. But how this young duo are portrayed is not consistent. For four of the five covers the Lads are depicted as young teenagers. But one one cover (Champ #19) the Liberty Lads seem to be a little younger. 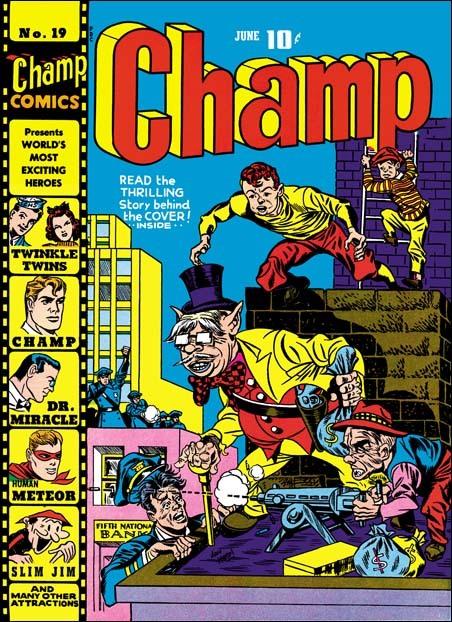 In my series of posting of the Harvey covers I have already examined Champ #20 and Champ #21 and you can look at those postings for their images. But here I am going to compare Champ #18 to Champ #19. 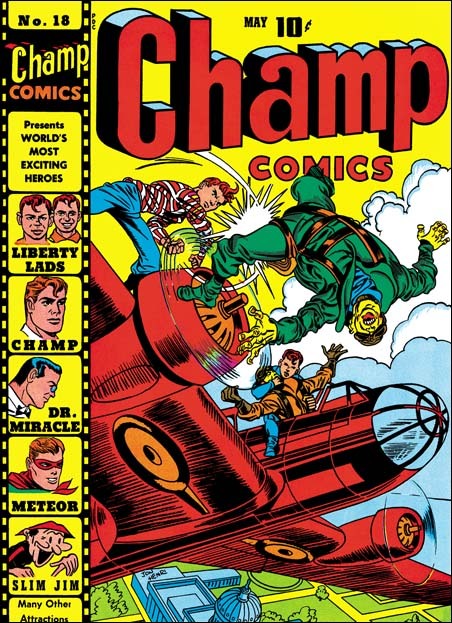 One thing to note is the exaggerated perspective used for the Japanese just hit by one of the Liberty Labs on the Champ #18 cover. Jack Kirby was the master at this almost 3D effect and although others tried to imitate Jack I do not believe I have ever seen anyone completely succeed. So when I see such a successful job as on Champ #18 (and also on Champ #20 and #23) I feel pretty confident that Jack Kirby was responsible. The one Liberty Lad about to leap on Champ #19 is not quite an exaggerated perspective (although still rather well done). But the lack of exaggerated perspective does not mean it was not done by Jack. The Liberty Lads on Champ #19 are not only younger they also look familiar. 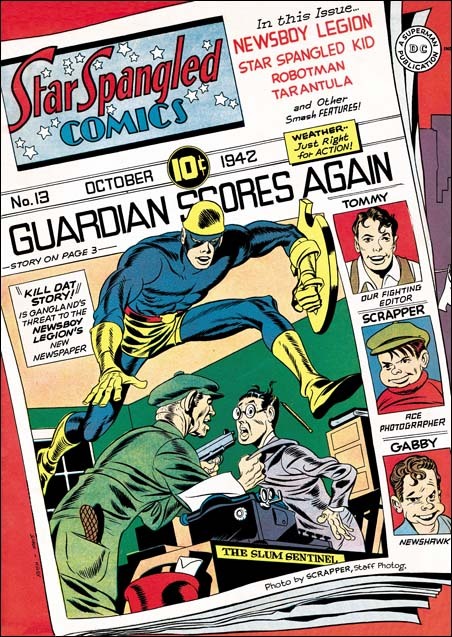 That is because they seemed based on Gabby and Scrapper from the Newsboy Legion. Although in the past it was generally believed that Kirby did not swipe, more recently examples of Kirby swipes have been well documented particularly by Tom Morehouse in TJKC. But why would Jack have to swipe the Liberty Lads on Champ #19 but not on the other four covers? To me the Liberty Lads swipes are more likely to be evidence of Joe’s involvement then Jack. One features that suggests Kirby is the square fist of the policeman on the far roof. Square fists are easily recognized manner used by Jack. But it is so obviously that there is little doubt that Joe Simon would see it also and it would not be hard for Joe to adopt it himself. But note the stiff, straight arm of that same policeman, that does not look like Jack’s work. By this period Joe Simon has advanced beyond the use of just two expressions that he had learned when he started comic book work (as described in The Comic Book Makers and quoted in Chapter 1 of this series of posts). But there are some expressions that Joe uses more frequently then Jack. One is having both eyebrows raising as they approach the midline. The policeman trying to climb onto the roof in Champ #19 is a good example of this eyebrow rendition. For me Champ #19 is one of those covers that looks so much like the work of Joe Simon that I am amazed that others do not see it. If in the end you do not agree with my attribution of this cover, I doubt you will find convincing any of the other Harvey covers I credit to Joe. The next best example of Simon work would be the Speed #21 (August 1942) that I posted on recently. Here the only Kirby-like feature that I find is the clown’s pointing hand. Everything else looks like Simon’s work to me. The device of an oversized hero is something I associate with Simon more then with Kirby. We have already seen Joe use this in the Blue Beetle #2 cover. Similarly the use of floating heads I believe is more typical of Joe. The style these floating heads seem to be Joe’s, especially the square ness of the jaws. 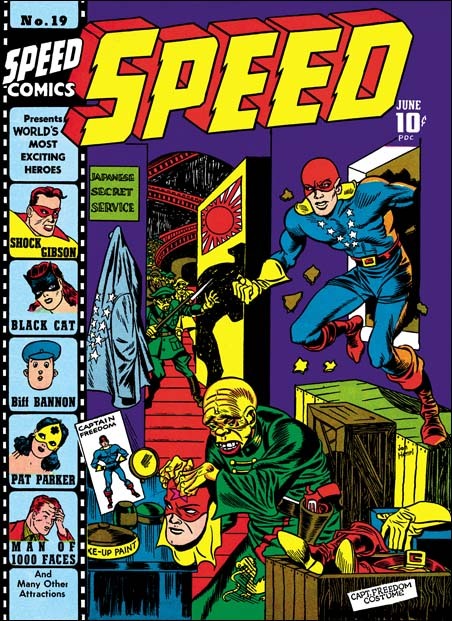 Another candidate for Simon work is the cover for Speed #19 (June 1942). The Japanese impersonator has the peaked eyebrows that Joe seems to favor. Captain Freedom has Jack’s square fist, but as I mentioned before I do not believe this is a reliable feature for distinguishing between Joe and Jack. I find the arriving Japanese soldiers look more like Simon’s hand. But frankly although I attribute this cover to Joe, it is not with the certainty that I feel for Champ #19 or Speed #21. The only other Speed cover I suspect may have been done by Simon is Speed #23 and that is without much confidence at all. I have not yet restored that cover so I will leave my reasons for saying it was done by Joe for a future post in my Harvey cover topic. 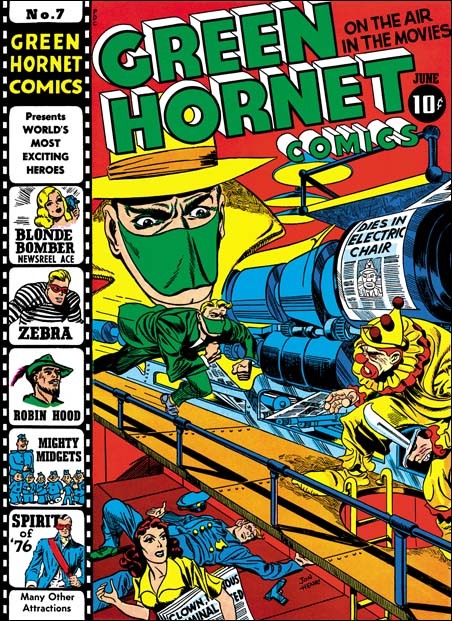 The covers for both Green Hornet #7 and #9 seem to have been done primarily by Jack Kirby. But on GH #7 there is a floating head. Because of the mask and hat, only the eyes are visible. To me they look like they were done by Simon. It seems that enlargement and floating heads are devices used at times by Joe but not by Jack. Some readers may have noticed that I did not include Champ #22, Speed #22 or Green Hornet #8 in my list of Simon and Kirby Harvey covers. These covers have characteristics that set them apart from the Jon Henri group. We will examine these three covers along with new information I have obtained from a recent conversation with Joe Simon in the next chapter.